This wall chart shows the Tabernacle at the foot of Mt. Sinai with the people of Israel camped around it. 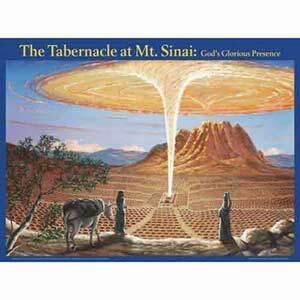 The cloud is the glory of the Lord filling the Tabernacle and covering the camp and the mountain (Ex. 16, 24, 40). The glory of the Lord reminded the people of God's presence with them. Wall chart is printed on heavy chart paper and is covered with 3 mil plastic lamination on both sides. The chart can be rolled for storage.